I was excited to see TO HELL AND BACK air earlier today on one of the Encore channels. Great film starring Audie Murphy. It has another showing tonight. I told my dad about it, and he was just as enthusiastic about it. Okay, this is driving me nuts. Near the end of the film Murphy's men meet up with a tank being driven by a young man wearing what looks like a 40s football helmet. He sounds like Dan Blocker but looks way too young to be him. (This is 1955, just four years before the start of Bonanza, and I can't believe he aged that much in so short a time). It's an uncredited role so there's no help there. Is it him? This is one of the best war films I've ever seen. The narration tells you what's happening in relation to the rest of the war and why which adds to the realism. You'd expect Murphy to be believable as he lived this but the rest of the cast makes you forget they're actors. The real footage used in some scenes also helps. This is 3 1/2 out of four stars. I see on IMDb that there's a Lloyd L. Wyatt listed as "Pierce - Tank Commander", an uncredited role. I couldn't find any pictures of him to compare to Blocker, though. It's ironic you "reactivated" this thread/discussion. Yesterday I received a DVD I had ordered from Amazon. It was one of those New Year's specials-- a four-pack of war films from Universal, for only $3.74 U.S. (too good a deal to resist!). TO HELL AND BACK is one of the films on the disc. I think I will probably review it in the Essentials forum in May, around Memorial Day. Audie Murphy was a very appealing movie star. There are some interesting comments about him in Tony Curtis' autobiography. Audie and Tony both became Universal contract players in 1949/1950 and reached stardom about the same time. They actually did two films together (I think Tony was still billed as Anthony Curtis in those early pictures). As they became more and more successful with moviegoers, the studio treated them royally. They wound up with their own bungalows on the lot next to each other. Tony said Audie was someone you didn't mess with-- he could snap at a moment's notice, if he felt you'd done something wrong. Tony was careful never to get on Audie's bad side. I'll take this as an answer to my question and let it drop. Thank you. The A&E bio of Murphy stated that he had severe DSS and slept with a loaded gun. When it became intense he would move to his guesthouse to spare his wife and children which would lead to stories about their separating. The rest of the time he was a likable and well-respected guy. He was also not an alcoholic, in fact he rarely drank. 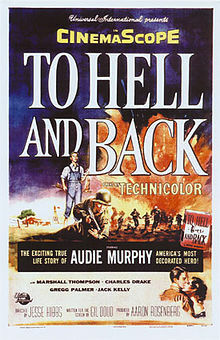 TO HELL AND BACK is very important because the film has details that Audie Murphy's autobiography didn't mention. To know the "whole story" you need to know both film and book.